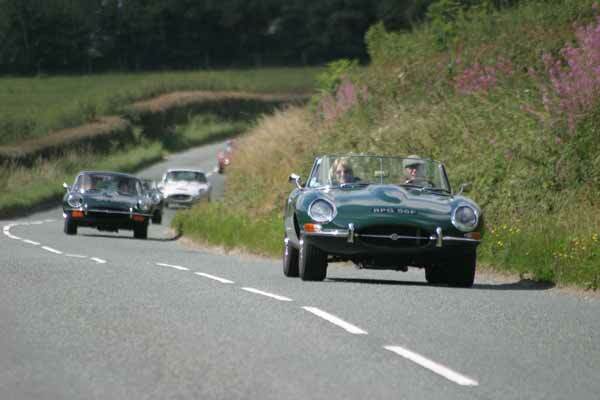 The Jaguar E-type Club is inviting all E-type owners to join its charity drive around the coastal roads of Great Britain between September 12th and 29th 2016 in aid of Prostate Cancer UK. The Jaguar E-Type club are aiming to get as many Jaguar E-Type sports cars as possible to take part in a around Britain Coastal Tour in aid of Prostate Cancer UK. Jaguar E-Type Club charity coastal drive 2016 – What’s on? The event starts near Goodwood the on Monday the 12th September, the day after the Goodwood Revival. The drive consists of 18 one-day stages, with on average 180 miles being completed each day (290 km). For this event the E-Type club have been clear the message is “Calling All E-types” and all ages, types and condition of Jaguar E-Type are welcome, including cars from overseas, bringing them together in a very different, and possibly unique, driving event. The daily stages are (finishing point): Lyme Regis (Day 1), Penzance (Day 2), Bridgwater (Day 3), Tenby (Day 4), Penryhndeudraeth (Portmeirion) (Day 5), Blackpool (Day 6), Carlisle (Day 7), Largo (Day 8), Kyle of Lochalsh (Day 9), Kinlochbervie (Day 10), Inverness (Day 11), Stonehaven (Day 12), Berwick-upon-Tweed (Day 13), Bridlington (Day 14), Cromer (Day 15), Maldon (Day 16), Folkestone (Day 17), West Sussex (Day 18). The event will also take in significant locations in Jaguar History such as Blackpool – where the company was originally founded and Cromer where Malcolm Sayer, the legendary E-type designer, was born. Just one of the charity fund-raising initiatives that the club are planning is to auction passenger seat rides for each half day. The crew of the car that has raised the most funds per day gets to lead off and wear the Yellow Jersey (or in this case Yellow Hat). Any businesses interested in supporting the event with Corporate sponsorship are invited to get in touch. All Jaguar E-type of every model, colour, condition and year are welcome. The Jaguar E-type Club was formed in 2004 by Philip Porter, author of 30 motoring books (and renowned E-Type owner himself). Today the Club has members in over 50 countries and organises events worldwide. The Jaguar E-Type club are keen on owners using their cars and not on polishing!